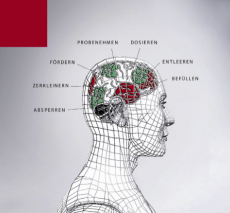 Technológia sypkých materiálov - plnenie a vyprázdňovanie Big baggov, sáčkov, kontainerov a malých nádob, dopravné systemý a dávkovanie, vzorkovanie; kompletné systémy, komponenty. Podľa zadania úlohy s alebo bez zdvíhacieho zariadenia, spodná alebo horná váha pre rôzne aplikácie a prispôsobenie doplnkov. Stacionárne alebo mobilné zariadenie, manuálna alebo automatická prevádzka. Pre čisté a presné plnenie sudov, vriec a krabíc, ručne alebo plne automaticky. Verzie adaptabilné pre širokú škálu úloh. Rôzne príslušenstvá, ako napr. vyprázdňovací pomocník, in-line pull-out zariadenie, zariadenie pre opätovné zatvorenie, odprašovacie a odčerpávacie zariadenie alebo zariadenie pre vyťahovanie Bagov. Zdvíhacie systémy s reťazovým pohonom alebo zariadenie so zdvihovým odklonom. Sacks are still a commonly used type of containers in industry. For discharging them, they are cut open and generally emptied into a sack discharge station. 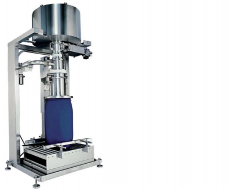 Sack discharge stations offer a convenient and compact possibility of discharging sacks in a low dust to almost dust free way. 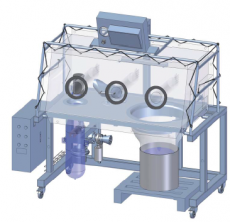 Depending on the requirements, the dust can be separated by means of an integrated filter with product return or using an independent filter. 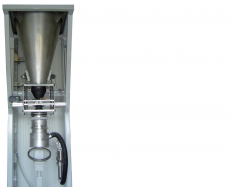 The side dumping outlet to an empty sack compactor or a collection container ensures a clean disposal of the empty sacks. 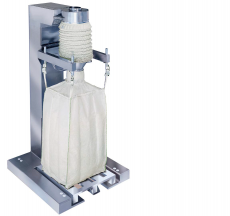 Sack discharge stations are available in standard or stainless steel as well as special materials. 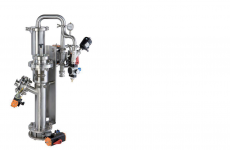 A wide range of requirements can be met from the simple robust and sturdy industrial versions up to dead material free and high quality versions for the pharmaceutical industry. Rôzne systémy pre každé použitie - davkovacie závitovky, vibračné dopravníky, Q-Dos, SoliValve, atď. We supply complete solutions for your in-house transport. Large distances can be covered in FIBCs or containers with rollers or using fork-lift trucks. For short distances and depending on your requirements, we supply conveyor screws or our pneumatic conveying system. 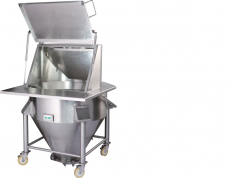 ProClean Conveyor PCC. Maintaining constant product quality is one of the main aims in every branch of the manufacturing industry. Continuous sampling and product analyses are absolutely essential in order to spot and remedy deviations in quality immediately. To obtain authentic, representative data on all the production material, samples have to be taken at the right place and in the right quantity. 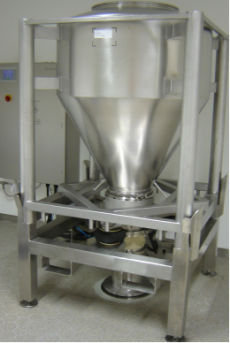 The EPS is intended for safe and contamination-free sampling of powders and granules in the pharmaceutical/API, food and chemical industry. 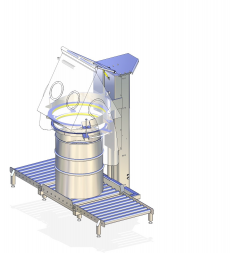 The flexible and disposable liner as product and operator protection as well as a connection adapter for different bins make the EPS a product of quality assurance in your company. This system is never open towards the environment. 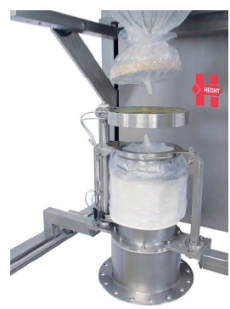 Closed powder handling, varying degrees of dust elimination To ensure effective operator protection, it is essential to contain the product on-site, from the first step in the production process until final packaging. The critical point is often the transfer between process units and containers (containers, drums, sacks or FIBCs). OEL/OEB classification (to define workplace limits) is carried out to select a suitable conveyance system. OEL/OEB stands for Operator Exposure Limit/Band. 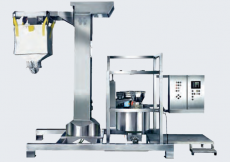 The ProClean Expendable Weighing Isolator EWI from HECHT is a flexible isolator with expendable liner technology for transferring and weighing of small quantities in the pharmaceutical, food and chemical industries. HECHT technology helps companies worldwide in planning and counseling - from the plant modernization up to the construction of a new production plant.